A. 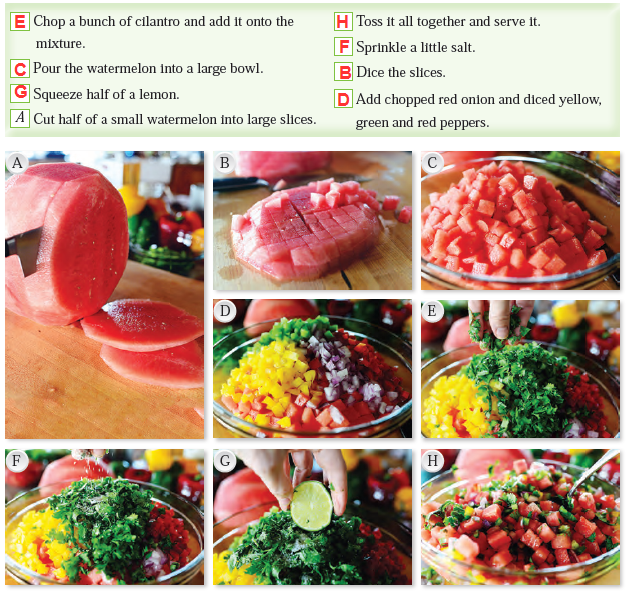 Look at the photos of the recipe for “Watermelon Pico de Gallo”. Read the steps below and write the letters of the related photos in the boxes. Use a dictionary when necessary. B. Read the recipe again and complete the missing ingredients below. ● Half of a small ........watermelon...................... (1), diced. ● 1/2 whole red .....pepper.......... (2), chopped. ● 1 whole red bell pepper, diced. ● 1 whole green bell pepper, diced. ● 1 whole yellow bell ..peper..... (3), diced. ● 1 whole bunch of .....parsley....... (4), chopped. ● half of a lemon, squeezed. ● 1/2 teaspoon of salt.